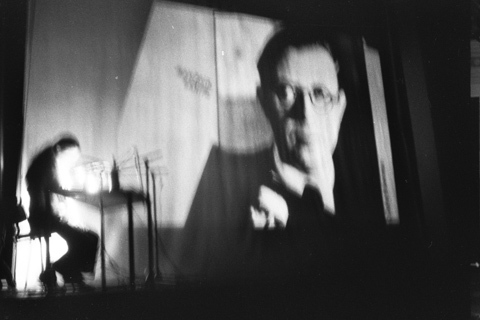 Previous event: ← Ear Here, Democracy in Action & Gamelan Mobilel et al. 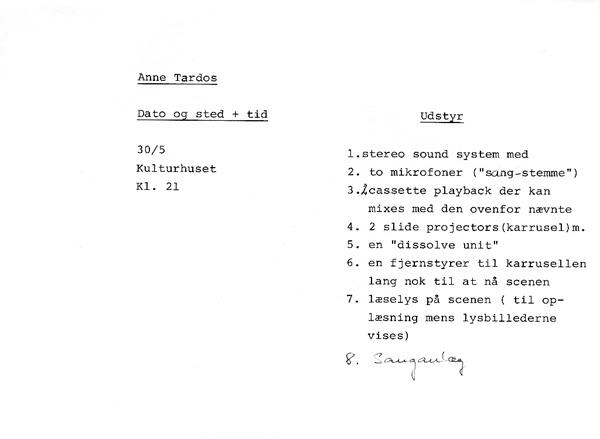 Born in France and raised in France, Hungary, Austria, living in the United States since 1966, Anne Tardos used 4 languages to relate the story of her life at The Culture House in Roskilde, with her multimedia piece “Autobiography in Four Languages”. 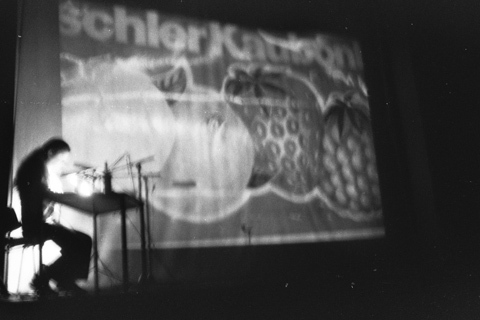 A slide projection illustrated the stories of her nomadic childhood and adolescence, and pre-recorded text sometimes mixed with her renderings. 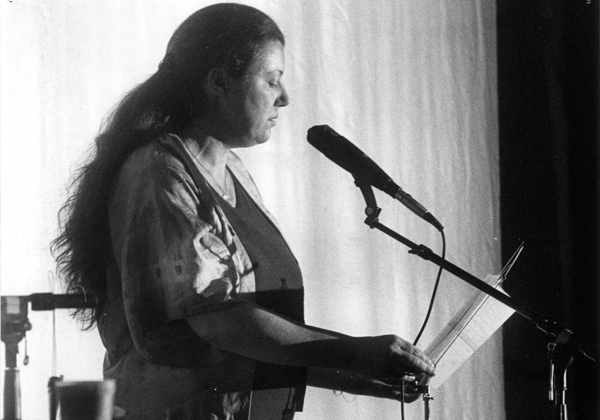 Anne Tardos also performed the work ”La-Ma-Na-Oa-Pa-Qua-Ra-Sa-Ta-Ua-Va”. 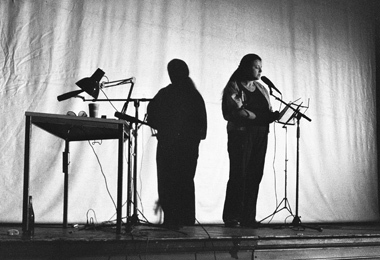 She sang phonetic mantras on top of multi-track playback, building an impressive meditational chant sometimes with drone-like effects. Jackson Mac Low co-performed with Tardos on some events; i.e. reading of place names, travel itinerary etc. of their last European tour while showing slides and snapshots. 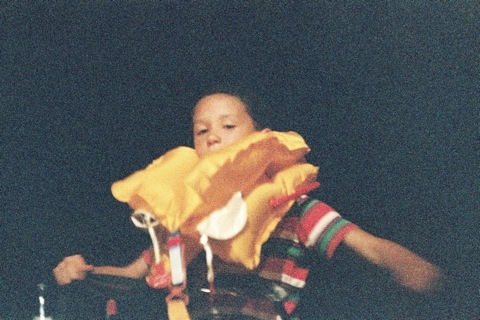 This event was performed by Emmett Williams, Bob Watts, Ann Noel, Alison Knowles, Ben Vautier, and others, who lined up on stage carrying life vests. 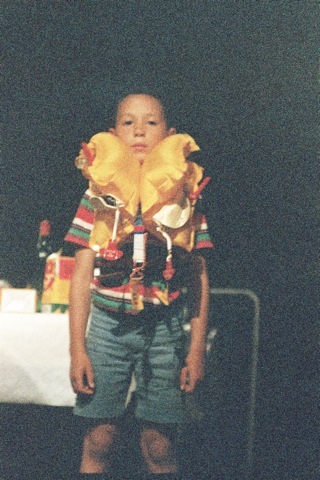 The piece began by each performer putting on and inflating their life vests. Performing this action was the entirety of the event; some life vests opened, other didn’t. 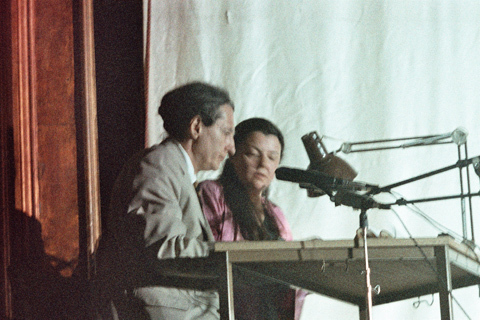 Anne Tardos’ performance was concluded with a vegetarian banquet on stage for both audience and performers. There was trouble with the sound equipment, the slide projectors didn’t work properly and that detracted somewhat from the simplicity of her stories about her origin, childhood and arrival in the United States, told in several languages, German, English, French etc, a mantra, sung with a multi-track playback, and the list of place names she and Jackson read - the travel itinery for their last European tour, with slides and snap shots they took along the way. The best piece came at the end, when 3 performers donned life-jackets, all different, which were to be inflated as fast as possible. - Henry Martin, “Festival of Fantastics” in “EAR Magazin of New York, p. 16, New York, November/December, 1985.